Here's a superb new online slots game from PlayTech that you can play. Get your whites on, it’s time for a spot of tennis with this all-action slot. You’ll be rewarded for taking centre court and smashing some aces on the reels with some top class prizes. If you love tennis this slot is a real winner, game, set and match. It’s got 5 reels and a huge 40 paylines to get your hands on. The graphics and design are simple but effective and you’ll have a suitably sporty soundtrack to keep you entertained as you play - grab yourself a bowl of strawberries and cream, stick on a sweatband and you’ll feel like Andy Murray at Wimbledon, honest. Check out our entire list of play slot games in the UK at SlotsBaby now. Playtech is one of the largest suppliers of online gaming and sports betting on the planet. They develop slots, casino games, traditional card and roulette games and popular sports titles. Playtech produce lots of licensed slots including Ace Ventura, Rocky and Blade games that capture the essence of these characters but don’t detract from the main betting action. All Playtech titles have recognisable sharp and detailed graphics, great sound effects and excellent gameplay. There are lots of tennis related symbols on the reels, get your hands on 5 of the tennis shoes or balls and you’ll get a 1000 coin reward. Land 5 of the tennis players (male or female) and a 5000 coin jackpot will be served up to you. 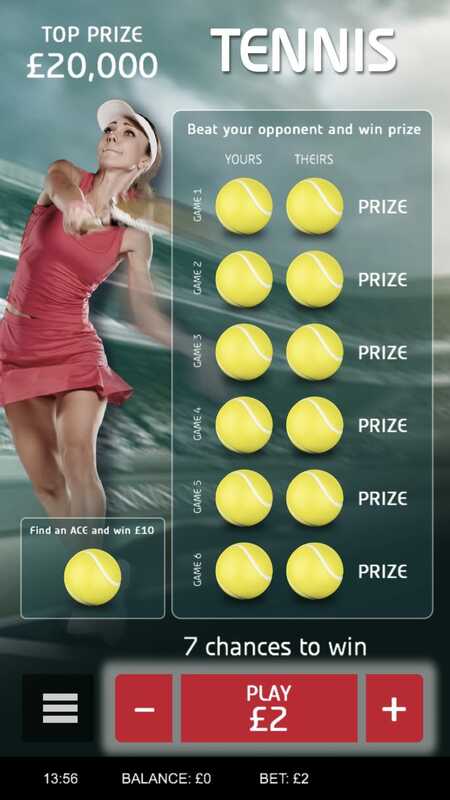 Land 5 of the male or female tennis player and a jackpot of 5,000 times your line bet will be heading your way. They’re joined by standard playing card symbols from A to 9. As well as this standard Tennis play there are two bonus features in this online slot to look out for. Championship Bonus feature – this will be activated when you get 3 or more of the scatter symbols anywhere on your reels. This feature gives you the chance to go head to head in a tennis match against the reels. The good news is you’ll always be victorious but you’ll get a bigger prize the more aces you serve – up to a max of 50x with a 5x multiplier. Trophy wild feature - If you land yourself a trophy wild symbol on the middle 3 reels you’ll trigger this classic free spins feature where you’ll be granted 15 free spins. In addition, all the winning combinations in these free spins will be trebled! Land the trophy wild on the middle 3 reels and you’ll trigger the other feature – it’s a classic Free Games feature where you’ll be awarded 15 free spins. That’s not all though as all winning combinations landed during the feature will be boosted by a 3x multiplier and trebled. The prizes get really lucrative when you get 3 trophy wilds during the feature as you’ll get another 15 games as well as a cash reward of 10 times your total stake! Bonus. This is an online slot with some pretty enjoyable on-court action. It’s no backhanded compliment to say it’s simple, classic in design and doesn’t challenge the player too much. It’s nice to look at and nice to play, and when the big bonus prizes hit it’s more than nice, it’s ace!